Rhoda Broughton was a popular novelist who lived at River View at the top of Headington Hill from 1900 to 1920. Rhoda was born at Segrwyd Hall, near Denbigh, north Wales, on 29 November 1840. She was the daughter of the Revd Delves Broughton and Jane Bennett. 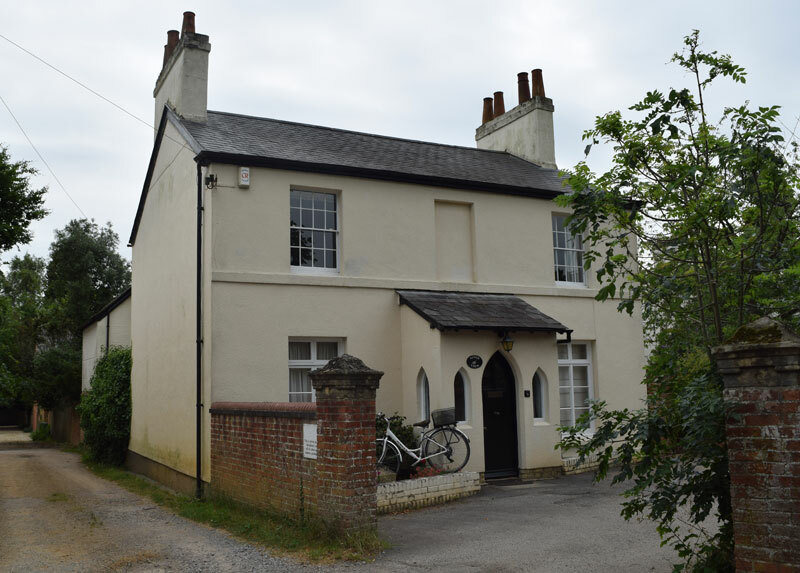 At the time of the 1841 census, six-month-old Rhoda was living at Wybunbury in Cheshire with her clergyman father Delves, her mother Jane, and her older sisters Ellinor (4) and Mary (2), plus four servants. In 1851 Rhoda (10) was living at Curzon Park, Cheshire with her father Delves (39), who was now the Curate of John's Deddington, her mother Jane (40), and her two older sisters Ellinor (14) and Mary Jane (13), and her younger brother Delves junior (4). The family now employed five servants (a housekeeper, nurse, cook, housemaid, and footman). Her mother Jane Broughton died in 1860, and at the time of the 1861 census Rhoda (20) was living at Broughton Hall, near Croxton in Staffordshire with her widower father Delves Broughton (49), who was now the incumbent and squire of Broughton, and her siblings Ellinor (24), Mary Jane (23), and Delves junior (14). They had five servants: a housekeeper, ladies' maid, two housemaids, and a cook. Rhoda wrote her first novel Not Wisely but too Well in 1862 when she was aged 22, but it was initially turned down. Rhoda's father Delves Broughton died in 1863, so at the age of 23 Rhoda had lost both her parents. At first she lived with her sisters in Surbiton, but following the marriage in 1864 of her sister Ellinor to William Charles Newcome, she went back to Denbighshire to live with them, and her novel Cometh up as a Flower was published in 1867. Her earlier attempt, Not Wisely but too Well was serialized in the Dublin University Magazine, then edited by Sheridan Le Fanu (who had married her mother's sister, Susanna Bennett, in 1843) and was published as a book later in 1867. The 1871 census shows Rhoda (30) living with the Newcomes at Upper Eyarth, Llanfair, Denbighshire, where her brother-in-law was a farmer of 105 acres: no occupation was listed for her. Five more of her books were published while she was living there: Red as a Rose is She (1870), Good-bye, Sweetheart (1872), Nancy (1873), Tales for Christmas Eve (1873), and Joan (1876). Her early novels were the most sensational, and Mrs Oliphant said in a review that “that it is a shame for women so to write”. Ellinor's husband died in 1877 at the age of 58, and by the end of that year Rhoda and Ellinor had moved to 27 Holywell Street in Oxford. Three of Rhoda's novels were published while she was living there: Second Thoughts (1880), Belinda (1883), and Dr Cupid (1886). At the time of the 1881 census Rhoda (40), now described as an authoress, was away from Oxford, paying a visit to Louisa de Rothschild, a baronet's widow living at the Park Mansion, Aston Clinton, Buckinghamshire. Her hostess's married daughter Constance Flower (37) who was at the house was also an authoress, and paying a visit were the poet Matthew Arnold (described simply as an Inspector of Schools) and a German artist called Anna Molique. Because of her risqué novels, Rhoda was often shunned by Oxford society. Charles Dodgson (Lewis Carroll), for instance, refused an invitation to dinner at which she was to be a guest on the grounds that he thoroughly disapproved of her novels. On 16 February 1886, however, she was invited to a ball at Headington Hill Hall by George Herbert Morrell and his wife. In 1890 Rhoda moved with Ellinor to 1 Mansfield Place, Richmond Hill, Surrey. Five more of her novels were published while she lived there: Alas! (1890), A Widower Indeed (1891, co-written with Elizabeth Bisland), Mrs Bligh (1892), A Beginner (1893), and Scylla or Charybdis (1895). At the time of the 1891 census Rhoda (50), now for the first time described as a novelist, was away from Richmond Hill, paying a visit to the home of a retired lead manufacturer and his wife at Nanty Glyn, Colwyn Bay. 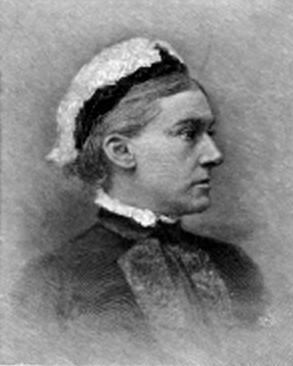 Rhoda's sister Mrs Ellinor Newcome died in 1894 at the age of 57. Rhoda remained in London until 1900, and two more of her books were published while she was there: Dear Faustina (1897) and The Game and the Candle (1899). In 1900 Rhoda Broughton moved to Headington to live with her cousin. Their house was River View at the top of Headington Hill (above), which is on the left on the lane that runs beside Headington reservoir, just behind Hill Top House. Rhoda's cousin, Miss Broughton, is listed as the householder here from 1901 until at least 1929. Rhoda was no longer ostracized by the people of Oxford, and undergraduates hoped for invitations to visit her at her Headington home. She also maintained a London flat at Cadogan Gardens in Kensington, where she spent a period of each year. In the 1901 census Rhoda (60), described as a novelist, can be found at 4 The Embankment, Bedford with her brother Delves Broughton (54), who was a retired Lieutenant-Colonel, and his wife and daughter, plus their three servants (a cook, parlour maid, and kitchen maid); but she was probably just paying a visit. I remember Miss Broughton telling me once that when she was young people said her books were fast and when she was old they said they were slow, and it was very hard since she had written exactly the same sort of book for forty years. At the time of the 1911 census Rhoda (70), described as a novelist, was away from Headington, staying at The White House, Torquay with her lady's maid. On a hill above Oxford, in a lane diverging from the high road to London, a sprinkling of little houses testifies to the anxiety of the University to escape from its slackness and its fogs into the rather better air of the higher ground. To the smallest of these cottages Sally Champneys had taken her restless body and stricken soul, and in the largest, which indeed partook more of the nature of a villa, the Hippisleys had established themselves. Headington is treated in the book as being in the depth of the country, and Sally remained there for some time. When Anne Hippisley returns to visit Sally there, she takes a hansom cab from Oxford railway station to the top of Headington Hill. Rhoda spent the winter of 1919 to 1920 in London, returning to Headington in the spring. She died at River View on 5 June 1920 at the age of 79. Her body was cremated at Golders Green on 9 June, and only Mr Newcome, her nephew, was present. A memorial service was held the following day at St Martin's-in-the-Fields. Her effects came to £6,377 9s. 7d., and her executor was her brother Delves. A companion memorial is dedicated to her sister Ellinor Newcombe. Both can be seen here under the heading “3. Inscriptions on the Walls”, Items 1 and 2.